Some people are meant to stay in the past and that is one of the biggest lessons to learn in adulthood. You ever find yourself thinking about a friend or former love, reach out to them, only to be reminded of why you stopped talking to them in the first place? Yep. I know you have because we all have done this at some point. We often try to bring individuals with us into our future without stopping to determine if they are truly meant to continue to travel along with us. Emotions get the best of us and we miss this person and the good times and forget about those times that made us walk away. It seems even more difficult these days because of the access we have to people. Facebook, Instagram, and other social media sites often keep you connected with people from your past and present. It keeps you curious about them and keeps them in the forefront of your mind. Don’t let those posts fool you. Just because you come across them in your timeline, doesn’t mean they should remain in the timeline of your life. Block them from your friends’ list or at least from your timeline. Don’t allow yourself to be held back. I have had situations where I tried to hold on to friendships that were bringing nothing to my life, where I was basically having my light dimmed because I was not receiving what I needed from this person. When you lose a friendship, you go through a mourning period. You go through the same thing with romantic relationship of course, but I can say from my end, there is nothing like having a friend that you can have girl talk with. And of course, we all have had romantic relationships that we held on to for so long because it was comfortable, because we had convinced ourselves that they were meant to step into “tomorrow” with us. 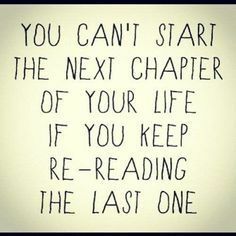 Just say “no” to opening up that chapter again. I’m not God, so I can’t say that everyone is meant to stay in the past. Maybe you needed a break from that person, maybe you weren’t ready for that relationship at that time, maybe you had to grow up to have a true friendship with someone. Who knows? This is something that only you can figure out. Next Post Check Me Out! Thanks for reading! Yes, very much a tough thing to accept, but so very necessary in many cases! What the heck is Flaxseed? Transitioning to Natural Hair: To Straighten or Not Straighten? "Ohhh Girl, You Got Good Hair!" I have a Masters in Healthcare Administration and a passion for people. I have strong proofreading and editing skills and want you to sound like the best "YOU" on paper.